The maximum operating pressure of a PEH pipe depends on the temperature of fluid and pipe. PN ratings are based on temperature 20oC. The pressure in a water supply system to an area is 4 bar. The cold water temperature will never exceed 20oC and the hot water distributed within the area with PEH pipes will never exceed temperature 50oC. From the table above pipes with PN 6 will do for the cold water. For the hot water PEH pipes PN 16 should be selected. Engineering ToolBox, (2006). 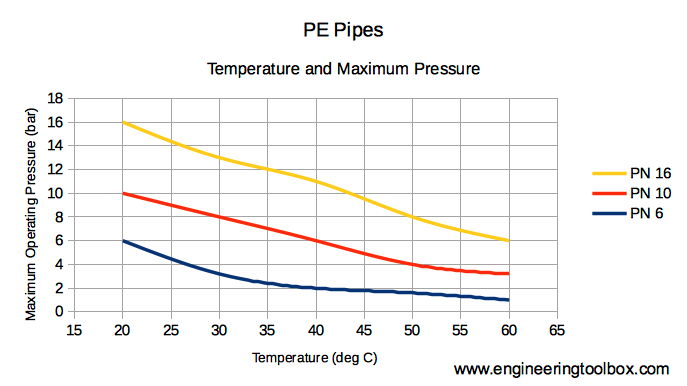 PE Pipes - Temperature and Pressure Ratings. [online] Available at: https://www.engineeringtoolbox.com/pe-temperature-pressure-rating-d_327.html [Accessed Day Mo. Year].